"I didn't know there was a second child," McHaskell said while in tears. "I would have went and got her." Monica McHaskell had gone to her front window when she heard a baby crying and saw a woman dangling a toddler over the upstairs rail. She then saw something she never thought would happen. She says the baby was thrown over the edge. She immediately scooped the toddler boy up, went inside her apartment and closed the door, fearing the woman would follow. 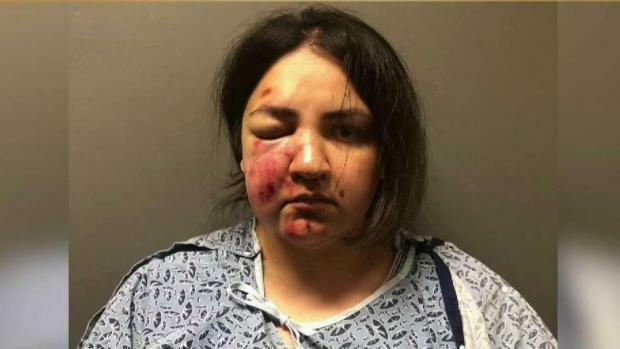 A mother was arrested and accused of throwing her baby over a balcony, then jumping herself. What police found inside her home, was just as disturbing. Hetty Chang reports for NBC4 News at 11 p.m. on Feb. 26, 2019. "I'm holding him, patting him, hoping he stops crying. Hoping he knows this doesn't happen all the time," she said, her voice strained. She called 911, and when police arrived, they saw an Upland mother hurl herself down the apartment stairs. Tierra Rose Ortega was taken into custody on suspicion of being the one who threw her toddler son over the balcony. But there was an even more disturbing scene inside the apartment where 7-month-old Ezlynn was found. Ezlynn had skull fractures. She was rushed to a southern California hospital, where she was pronounced dead. Ortega, 24, was arrested Tuesday on suspicion of killing her daughter and attempting to kill her son Jerricho. She was expected to face arraignment Thursday. Jerricho would not let go of McHaskell, and so she carried him to the ambulance. She did not realize authorities had found another child in the apartment until she saw paramedics attempting to resuscitate her. "I didn't know there was a second child," sobbed McHaskell, 51, herself a mother and grandmother. "I would have went and got her." The mother was in handcuffs after police arrived and found she had allegedly thrown a baby from the balcony, then jumped. A second child was found inside with severe injuries and later died. Patrick Healy reports for the NBC4 News at 5 Tuesday, Feb. 26, 2019. Jerricho, 19 months, remains hospitalized with a broken foot and other injuries. He was listed in fair but stable condition, according to Upland Police. McHaskell took some comfort from hearing that the boy is expected to recover from his injuries, and to be well enough for his father to take him home Thursday. Upland police said they have interviewed Tierra Ortega, but declined to reveal what she said. Investigators have also spoken at length with her husband, who was at work when the incident occurred, and was clearly distraught when he returned home. "Based on the nature of investigation, we're not comfortable releasing a definite motive," Capt. Marcelo Blanco said. At the apartment complex Wednesday, groups of neighbors could be seen hugging, some still in tears. McHaskell had been so shaken by the incident that shortly afterwards she was transported to a hospital, and was not able to return home until early Wednesdy morning. 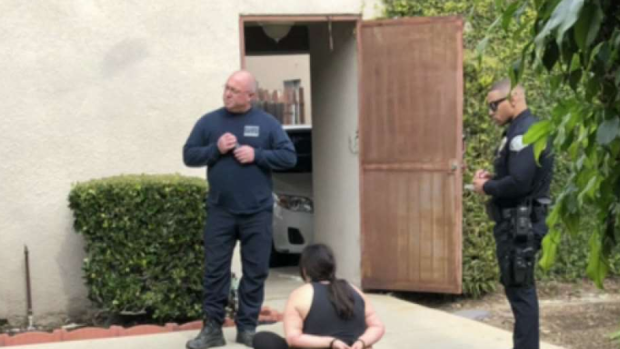 The Ortega family was described as "nice Christian people" by one neighbor, and many said they had no previous inkling there was any problem in the household. But one tenant in the complex, Michelle Furlong, said she often heard crying when she passed in the hallway outside the Ortega apartment. 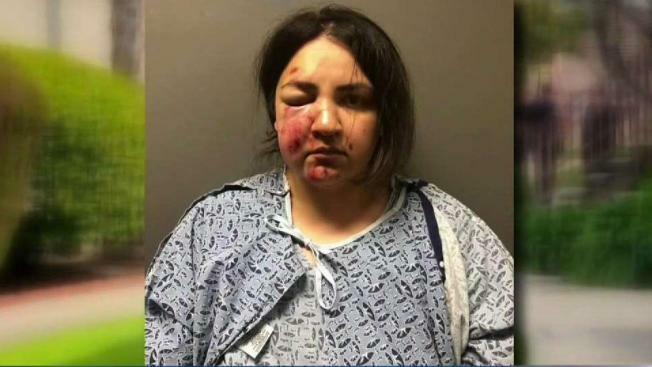 The neighbor in the apartment next door, Geraldine Jimerson, said she had heard prolonged crying for the past several months, and especially during early morning hours. The past week, when she has been home most of the time on medical leave from work, she has heard other disturbing sounds from her neighbors' apartment, she said. Tuesday morning, about an hour before police arrived, she recalled hearing a "thud--like somebody threw something against a wall." It was so loud she heard it over the sound of the television she was watching. She often saw Ortega's husband around the complex, coming home from work, doing laundry, but rarely saw the wife, and was suprised never to see her take a stroller to the nearby park, Jimerson said. She knew of the infant girl, but was not aware of the brother. What police say Ortega did Tuesday stunned Jimerson. "I just never thought she would do something like that," she said. Stunned as well were police officers who responded, and detectives who have been conducting the investigation and speaking with grieving family members. After a discussion Wednesday morning, Upland police decided to set up fundraising for the Ortega family, said Capt. Blanco. 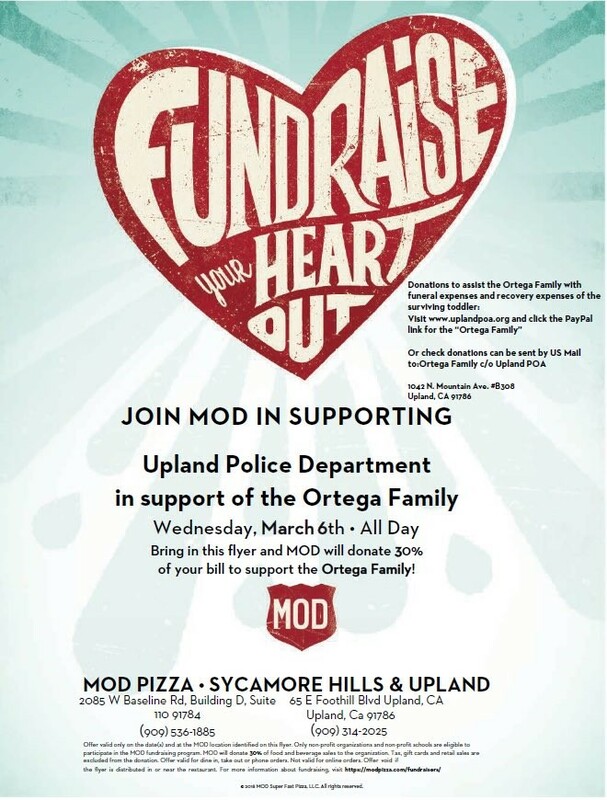 On March 6, Mod Pizza in Upland and Sycamore Hills has agreed to dontate 30 percent of all bills to the Ortega family, and the Upland Police Officers Association is setting up an online account to accept monetary donations, Blanco said.